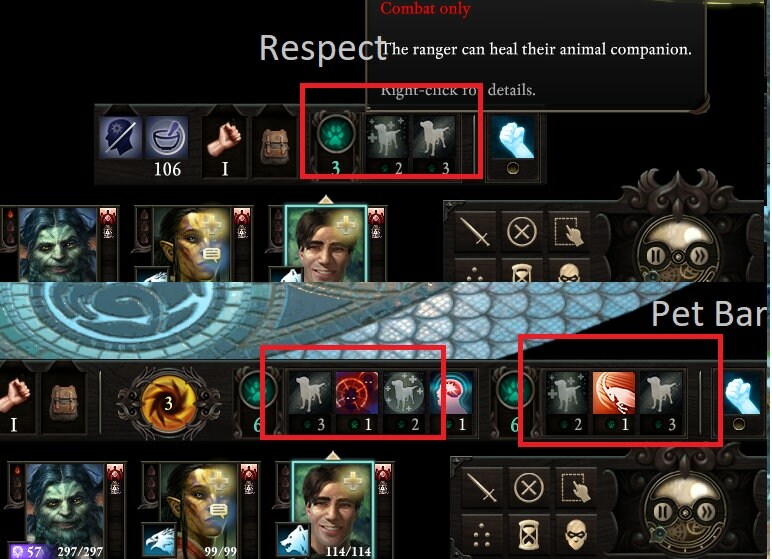 As title says if you make a ranger ability autogranted, like Heal Companion at PL 2, this "bug" appears after a respect. Actually the thing is a little more complex. When you respect the autogranted abilities don't go away, they are still on the bar. So in my very specific case at level 1 "Heal Companion" is on my bar, and it properly works, nothing unusual. As soon as you level to the PL you get "Heal Companion" for free, the bar of abilities splits, you have 2 resource for the class, shared, once is for the ranger, the other is for the pet and "Heal Companion" is duplicate also for the pet. Heal Companion cannot be casted by the pet because of the prereq of targeting an animal companion, that the pet hasn't, but, if you autogrant "Mark Of the Hunt", in this case the duplicate ability can be used by the pet. This is an issue I can't find a workaround. Could try and lock it in the progression table behind a "IsKith" conditional check? Edited by mammasaura , 08 August 2018 - 12:09 AM.